Proper positioning is crucial in the prevention of pressure ulcers. Due to the material it is comprised of, Poz’in’Form cushions offer all the required features in bedsore prevention. The combination of a micropore fabric and a bi-elastic and breathable Pharmatex or Lenzing FR cover offers maximum breathability of the cushion. Cushion filling is made of thin microfiber which perfectly fits the body shape, ensuring optimal pressure distribution, and contributes to a significant reduction in friction and shearing forces. 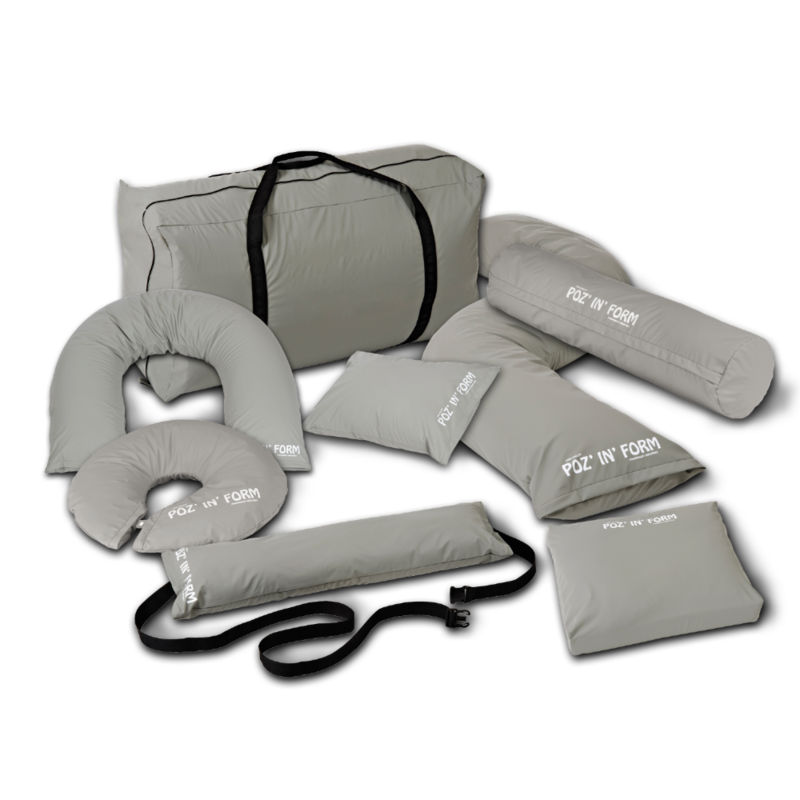 Poz’in’Form cushions are designed to perform various support and comfort functions for long-term bedridden people. The microfibers prevent from creep effects that are regularly observed in classical positioning and from early deterioration of the support. The various forms, sizes and models of Poz’in’Form allow for a wide range of positioning possibilities. Poz’in’Form elements and modules are completely removable and washable. There are two cover options available, Pharmatex or Lenzing FR. The Pharmatex bi-elastic cover is made of polyurethane and is recommended for use in hospitals. Pharmatex is soft to the touch and very comfortable next to the skin, while still easy to clean. The Lenzing FR cover is made of viscose, coated with a waterproof polyurethane film. Lenzing FR® is a major innovation in positioning of the long-term bedridden, preventing maceration. Hygroscopic properties of viscose allow moisture absorption. Also, the elasticity and flexibility of Lenzing FR are particularly suitable for problems regularly observed in classical positioning. Cushion which adapts to all morphologies. Placed under knees, it supports the knees’ joint, prevents the patient from sliding downwards and reduces friction and shearing effects on the sacrum’s area. It can be used in a semi- fowler position and helps to maintain a perfect position while relieving pressure in sensitive areas (sacrum, ischial tuberosities, heels) and shifting it to low-risk zones (calves, thighs and back). Three sizes available, meaning the universal cushion can be used in many different ways. In lying down the 55 x 40 cm size can be used for the knee flexion and a moderate hip abduction. The smaller cushions help to hold the patient in optimal positioning thus reducing bedsore risks and abnormal postures. Placed between legs, it reduces friction and shearing effects on thighs and knees’ area. It can also be used under ankles to relieve pressure. Used in crotch area when the patient is lying down to hold hips abducted and legs apart to reduce friction and shearing effects between legs, on the inner sides of knees and calves. A multi-purpose cushion, it comfortably supports shoulders, back, hips and knees when the patient is lying in lateral position. Moreover, it reduces friction and shearing effects. In combination with the cylindrical cushion, the half ring cushion reducesfriction and shearing effects between legs, on the inner sides of knees and thighs and holds hips abducted. It can also be used under the neck. The hollow ensures an optimal positioning and a pressure relief on the occipital area. The combination of memory foam and microfiber allows a regular relief on the contact zones. Placed at the bottom of the bed and fixed with an adjustable strap. The pressure on the heels is completely discharged. The heel cushion holds the ankles in a proper position. Positioning cushion for the hand to reduce the pressure on the skin on the zones with risk of pressure sores. It is advisable after surgical operations. It reduces the number of pressure sensitive bearing points and allows a discharge of the elbow area. Its size allows a pressure relief on the wrist. leads to a better blood circulation. Its size allows pressure relief on the Achilles’ heel.